The use of RFID tags and labels for increasing visibility in the supply chain and ensuring real-time tracking of merchandise is growing exponentially. From E-commerce giants such as Amazon applying RFID systems to increase their delivery speed to Disney World’s creation of MagicBands to enhance their customer experience and interactivity, RFID solutions are finding utility across every vertical of the industry. Radio Frequency Identification is an Automatic Identification and Data Capture (AIDC) technology which uses radio frequency to code data on tags and labels. An RFID system comprises of a microchip, an antenna, and a reader. These tags can be classified into two different types based on the range of their readability: Active and Passive. Active tags can be read over distances ranging beyond 250 meters while passive has a relatively shorter field of readability. RFID technology uses electromagnetic waves to code information on tags and labels. The reader is used to create an electromagnetic field around the tag which is received by an antenna. Once the antenna transmits the power from the magnetic field to the tag, the tag then modulates the information and sends the data back to the reader. These modulated waves are decoded by the reader and are used to track the exact location of the object. What Kind of Tags Should You Opt for? RFID tags can be classified in two separate categories: Active and Passive. Active tags have a pre-installed power source which enables them to transmit the re-modulated data over longer distances while passive tags use electromagnetic waves created by the RFID reader to do the same. Depending on the requirement for your industry, you can select the tag ideally suited for your operations. Active tags work better in rugged environments and can be the right option for businesses like warehousing. On the other hand, industries like healthcare which require delicate handling of the inventory can benefit from the use of passive tags. You can consult our experts to find the best option for your business. Where is RFID Implementation Most Practical? What is The Estimated Cost of Implementation? 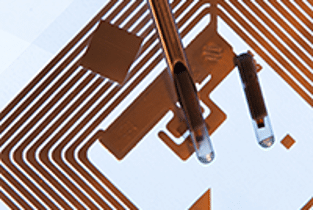 The cost of implementation for RFID applications varies from business to business. It is recommended to consult professionals who are experienced in traceability, like the experts at Jet Label and Jet Marking Systems to estimate the right budget for your organization. Request a quote for your RFID labels online or contact us toll-free at 1-866-440-5135 for an accurate evaluation today.